An automatic choice for your corporate gifts or branded merchandise! These superb world clocks feature an automated function to find the time in one of 24 world cities. Simply turn the dial to point to any of these 24 locations and the clock hands will automatically turn to the time for that zone. The clocks are set in a fine quality silver plated case and the dial face features a black and silver world map. 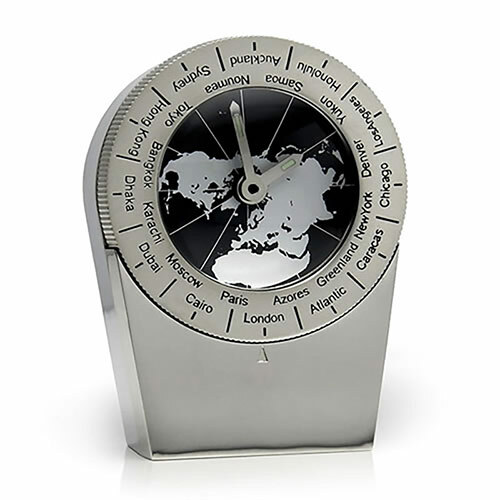 The cases of these clocks are perfect for engraving as corporate gifts or logo branded merchandise, and these world clocks are offered with free text and logo engraving.